Welcome to First Parish in Hingham, Unitarian Universalist, known as Old Ship Church. We are a liberal Unitarian Universalist community of about 250 members of all ages. More than 100 children and youth participate in our religious education programming. We worship in an historic Meeting House and we hold religious education classes and gather after services in our Parish House across the street. Our minister, Rev. Kenneth H. Read-Brown, has been with us for 30 years. Our Meeting House, a National Historic Landmark, has stood on Hingham’s Main Street since 1681. It is the only remaining 17th-century Puritan meeting house in the U.S.
Our community encourages personal spiritual growth through worship, engagement and service to others. We do not require adherence to a specific creed. We affirm the Unitarian Universalist (UU) Principles and Sources, and we support each individual's unique search for truth and meaning. We are proud that our community is both a "Welcoming Congregation" and a "Green Sanctuary," both official designations from the Unitarian Universalist Association. We cherish diversity of religious backgrounds, racial and cultural identities or backgrounds, ethnicities, national origins, ages, ranges of ability, sexual orientations, gender expressions, financial means, educations, and political perspectives. We welcome all to share in congregational life. What are Unitarian Universalists? click here. ​From September - June, we are happy to give tours, but kindly request two days notice in order to arrange a volunteer tour guide. Please call 781-749-1679 or email the office to schedule a tour. Please note: Old Ship Church is not open unless there is a tour scheduled. To receive weekly e-updates, sign up here. We are very pleased to welcome you to Old Ship. We want you to feel comfortable among us. For a glimpse into our congregation, please watch this introduction to Old Ship Church, a video put together by our former ministerial intern, Dave Egan. Enjoy! 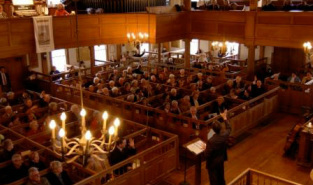 From September through mid June, our worship service, held in the Meeting House at 90 Main St., begins promptly at 10:25 am and lasts about an hour. You can park along Main Street on either side of the street, or along the circular driveway in front of the Parish House. The Meeting House is handicapped-accessible. A few handicapped-accessible spaces are located at the top of the circular drive in front of the Meeting House. Childcare, located in the Parish House, is available before and during Sunday services. Our Parish House, where we hold religious education classes, child care, fellowship hour, meetings, the office, etc. is across Main Street from the Meeting House at 107 Main St. It is handicapped-accessible, with parking spaces and the entrance on the left side. Click here for more information about what to expect on Sunday morning. Chris Hossfeld and our choir will lead this service: "Palm Sunday: Music of Sorrow"
Rev. Fox says, "Change happens! We know this, but the extent of change can catch us unawares. There are times when not only change but transformation happens. This is most obvious in the dramatic awakening of the earth after a harsh New England winter. We may not have a 'Damascus Road' transformation, such as happened in the story of Saul of Tarsus, following the Easter story but transformation can occur in our lives--our psyche and our body. How can we become more aware of this phenomenon and how it can enhance our lives? Let's explore!" For the younger set: Yes, we have an Easter Egg hunt! But, it is not a competition. It's a cooperative scavenger hunt. Click Here for some helpful hints. Sensible shoes are encouraged! Karen Churchill, the chair of our Worship and Music Committee, will be our preacher and worship leader. Karen's topic is: "Communities as Present Day Tribes." She says, "we used to be born into our tribe but the present day now asks most of us to choose our own community. How do ancient tribal concepts apply to our communities today?" Always entertaining and always someone to sing along with, Eric Cornetta shares songs which took him from coffeehouses in Chelmsford and Harvard Square to Greenwich Village, Nova Scotia, and London. You’ll be encouraged to join in enjoying a cheerful mix of originals, covers, and traditional songs with this long time local Hingham troubadour. A long-time tradition, May Breakfast, generally held the first Saturday in May, features a pancake, egg and sausage breakfast as well as a vibrant spring plant sale. People from throughout Hingham enjoy a morning of good food and company while welcoming the rites of spring. Support Old Ship Church through Amazon Smiles! Using this link below, shop on Amazon and a portion of the sales are donated back to Old Ship! How? Start here: https://smile.amazon.com/ and designate Old Ship Church as your charity of choice. Old Ship is proud that the Meeting House Restoration Project completed in 2014 received a significant award: The 2015 Massachusetts Historical Commission Preservation Award, given for Restoration and for Stewardship. Click here to donate to helping preserve the historic Old Ship Church, including the current major project: restoring its steeple. Curious about the early history of Old Ship Meeting House and of Hingham? Parish House office hours: Monday - Friday, 9am - 2pm. until June 30. July and August, Wednesday mornings, 9am-12. Please note: the office is located in the Parish House, which is a separate building from the Old Ship Church.